What do you think is the best and worst of Stoke-on-Trent? Do you have pictures of something that you really like about Stoke-on-Trent or something you really don’t like? We have created a Flickr group where you can add your photos and a description of why you think it is good or bad. A slide-show of some of the pictures taken at the General Election Count. Stoke on Trent should start to see the green shoots of regeneration very soon! By April, drivers using the Potteries Way route in and out of Hanley Town Centre will experience a very easy on the eye aspect which marks the start of the serious regeneration of our city. 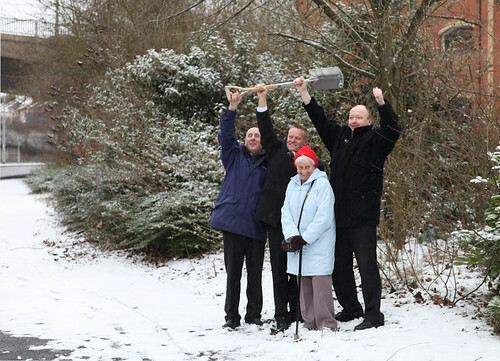 Richard Day (City Centre Partnership Spokesman), Elected Mayor Mark Meredith, Margarat Stuscinskas (Local Resident) & Councillor Adrian Knapper mark the start of the Potteries Way project with the most shiny shovel you have ever seen! A multi-million pound regeneration of the gateway to Stoke-on-Trent city centre will begin this week. The £1.8 million project to improve Potteries Way marks the first of many improvements for the city centre as part of the North Staffordshire Regeneration Partnership’s (NSRP) £1.5 billion transformational plans. 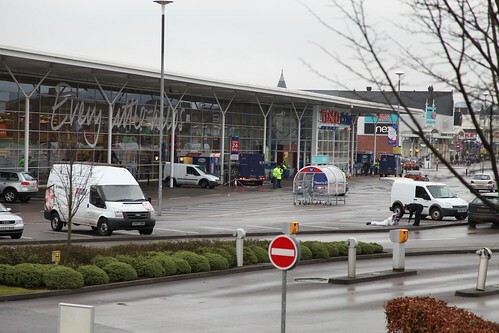 To start the work, around 160 poor quality trees along Potteries Way will be removed and replaced with semi-mature trees. The work will replace trees that are potentially dangerous or not growing properly, provide instant impact and add to the green image of the area. In addition new ‘instant’ beech hedgerows, which are pre-grown by a specialist nursery, will be planted to provide extra screening at the back of houses and businesses. Overgrown ground cover and shrubbery will also be cleared and replaced with neat grass verges. the strip of road. The columns will feature colourful image panels designed to welcome visitors to the city and direct them around the central ring road. These semi-permanent panels can be used to highlight activities and places in the city centre. They can be replaced for short periods with temporary banners to highlight particular events, such as the Tour of Britain cycle race and Christmas lights switch-on. During the work trees and hedgerows are to be delivered on site and offloaded from the inside lane of the carriageway. Deliveries will be scheduled to avoid peak traffic hours. 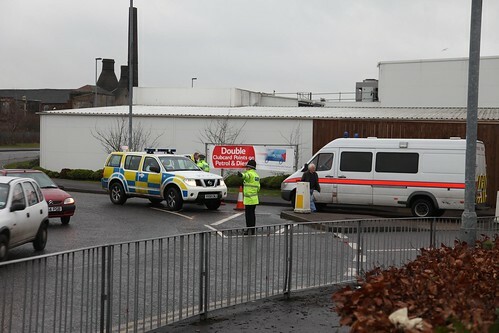 However, motorists are being warned there may be times sections of the road will be cordoned off for deliveries. completely transformed with new education facilities, more housing, a proposed regional shopping centre and 100,000 sq m business district. Pitsnpots’s Batman & Robin aka Mike (our new photographer) and Tony, were at the launch today, and as well as these lovely wintry pictures managed to catch up with Elected Mayor Mark Meredith who is also Chair of the NSRP. 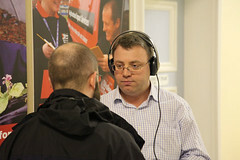 We also spoke to Adrian Knapper, Stoke-on-Trent City Council portfolio holder for regeneration and economic development. 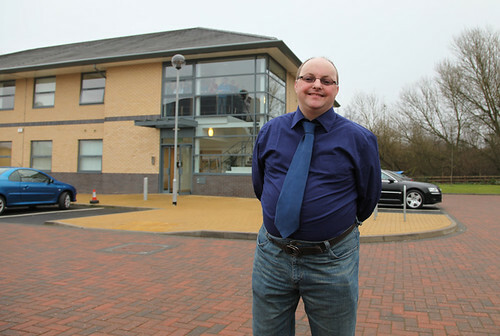 Yesterday Tony Walley went along to the new Riverside Employment Training Centre for the official opening. 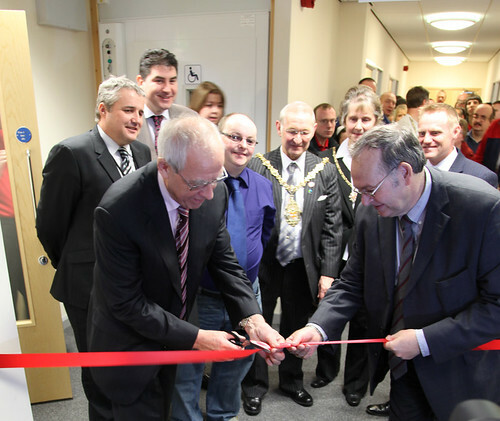 The Riverside Centre specialises in helping adults with learning difficulties in to employment and worked based training.Ã‚ Ã‚ The million pound centre opened its doors in November but had its official opening on Thursday with Stoke City Chairman Peter Coates joining Lord Mayor Derek Capey and Elected Mayor Mark Meredith to cut the ribbon and open the centre. Councillor Ellie Walker was at the opening along with Rob Flello MP. Since November the facility has already helped 43 adults with learning disabilities into work or work placements, and a further seven are completing courses to develop their job skills.Ã‚ Adults are referred to the Riverside centre on a rolling basis. They have their needs assessed and are able to enter onto a 16-week Smart Start programme to learn work skills and put those skills into practice on work placements. At the end of the course, staff work with the trainees to support them into paid or voluntary employment, depending on their wishes. David Meeson – Riverside Centre user. The million pound Stoke-on-Trent City Council facility, whichÃ‚ replaces the Hamilton Centre in Fenton, will help users gain skills which canÃ‚ be put to use in service sector jobs, such as self presentation and interviewÃ‚ skills, developing CVs, interacting in groups and improving their health andÃ‚ safety awareness. Tony interviewed David Meeson & Sandra Robertson who are centre users as well as Peter Coats and Mark Meredith. As previously reported by Pits ‘n’ Pots, Gavin Webb went before the Standards Committee today for a hearing about his alleged breach of the members code of conduct by the use of the F words, (F**k & Fascist) during a meeting in February 2008. Gavin sat infront of the Standards Committe, made up of Councillour Joan Bell & Councillour Alan Rigby and chaired by Mr John Sherratt.Ã‚ Also in the meeting were Clare Clarke, the officer who investigated the alleged offence, Councillor Michael Coleman who brought the matter to the Standards Committee and Paul Hackneyfrom the council leagal department. After over an hour of deliberation, the panel found Gavin guilty as charged.Ã‚ Gavin now has to write an individual letter of apology to each member of the committee. 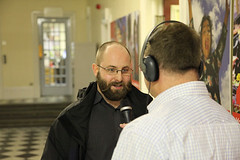 Tony caught up with Gavin right after the hearing at Civic Centre and recorded the following interview. Mike Coleman (pictured left) spoke exclusively to pitsnpots after the Standards Board Hearing and he confirmed that he was disappointed that there had been a need to take this matter to the Standards Board in the first place. Mike felt that every councillor had a duty to uphold the standards required by the “Councillors Code of Conduct” He said that Gavin Webbs actions and comments were offensive and he objected strongly to been insulted, sworn at and pointed at. He also added that if Cllr Webb had offered to apologise after the incident had taken place, there would have been no need to involve the Standards Board at all. He hoped that Cllr Webb would include an assurance that there would not be a repeat of this type of conduct at any time in the future, in his letter of apology to the members of the Task & Finishing Group who were present at the meeting. He said he held no grudges toward Cllr Webb and that as far as he was concerned the matter was no closed. It was obvious to me that both sides showed tremendous respect for each other during the hearing and while we were all waiting for the decision and indeed after the hearing had finished. All concerned acted impeccably and with good nature and for me it was reassuring that our city councillors were able to put differences to one side and carry on working and interacting with each other. I would like to thank Sir Findo for his assistance this afternoon and for his effort in trying to show my best side in his excellent photographs! 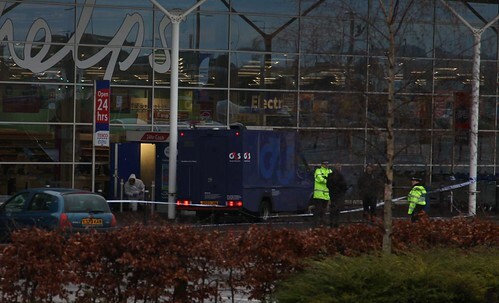 Two men dressed in dark clothing with their faces covered, approached security guards as they were filling up cash machines outside the Tesco Extra store on Baths Road in Longton at around 8am this morning, one of the men was reported to have had a hand gun. The police have reported that there were no injuries during the incident and it is not yet known how much money was taken during the robbery.Ã‚ CCTV footage is now being examined to see if any further clues can be gained. Police have not released any more information but have said they are looking for a silver car driven by a third man in relation to the incident. Anyone with information should call Stoke-on-Trent CID on 0300 123 4455 or call Crimestoppers anonymously on 0800 555 111. 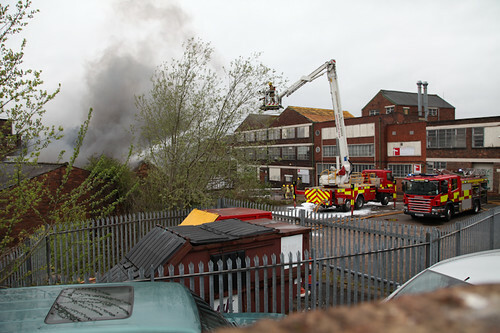 Thanks to Mike Rawlins of Longton for supplying the pictures below. Police at the scene searching for clues.